When Stephen Stedman entered Stanford in the late 1970s as an undergraduate, his career ambition was to be either a poet or a lawyer. Those plans went out the window winter quarter of his freshman year when he took a class on political leadership taught by the late political scientist John Lewis. For nine of the 13 quarters he spent at Stanford as an undergraduate, Stedman took a course or tutorial or did honors work with Lewis. Helping his mentor develop an undergraduate seminar and then producing a senior honors thesis based on that seminar was life-changing for Stedman. “I had a light bulb moment: I should become a professor. I want to do what John Lewis does,” he said. Now, with a thirty-year career in academia, Stedman has taken on a new role this year: chair of the Faculty Senate. To that end, Stedman is hoping to devote more time in senate meetings for discussion of critical and timely topics. Some of the issues the senate is focusing on this year under Stedman’s leadership include the university’s global presence, diversity and inclusion, free speech, a review of the university’s Fundamental Standard and Honor Code and an evaluation of the Ways of Thinking/Ways of Doing requirements. “A lot of Stanford faculty are incredible undergraduate teachers, but I also think if you are a faculty member who was an undergraduate here, you especially care about undergraduate education at Stanford,” said Stedman. He particularly enjoys teaching introductory seminars and mentoring students in the Fisher Family Honors Program at the Center on Democracy, Development and the Rule of Law (CDDRL). “It is both fun and enormously rewarding to help really smart students identify important research puzzles and give them the confidence and support to solve them,” he said. As a first-generation college student, Stedman knows firsthand the value of the residential experience in shaping and supporting undergraduate life at Stanford. His commitment to undergraduate education is exemplified by the 15 years he and his wife, Corinne Thomas, have served as resident fellows (RF). He said that living in a dorm gives him a front-row seat into undergraduate life at Stanford and an opportunity to be a resource to students outside of the classroom. Currently living at Crothers Hall, Stedman and Thomas also spent several years as RFs in Larkin House, a residence for first-year students. They have raised their two children on the Farm, with the eldest currently in her first year at Tulane University. The only break Stedman has taken from academia began in 2003 when he was recruited to become research director for a U.N. panel on international security. He was a principal drafter of the panel’s report and, upon completion of that work, Secretary-General Kofi Annan asked him to remain at the United Nations as an assistant secretary-general to help gain worldwide support in implementing the panel’s recommendations. 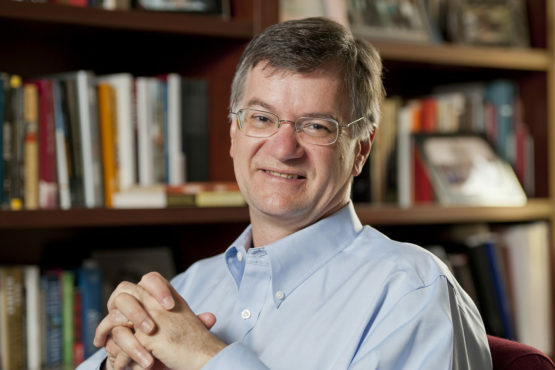 Following the U.N. world leaders’ summit in September 2005, during which more than 175 heads of state agreed on a global security agenda developed from the panel’s work, Stedman returned to Stanford. The U.N. connection has led to other projects for Stedman. From 2010 to 2012 he served as director for the Global Commission on Elections, Democracy and Security, which was tasked with developing recommendations for promoting and protecting the integrity of elections worldwide. The commission was a joint project of the Kofi Annan Foundation and International IDEA, an intergovernmental organization that works on international democracy and electoral assistance. This year the Kofi Annan Foundation tapped Stedman to serve as secretary general of the newly formed Commission on Democracy in the Digital Age, chaired by former president of Costa Rica Laura Chinchilla. The commission’s charge is to shed light on the rapidly changing role of technology and social media in elections around the world and to recommend ways to ensure that digital tools strengthen, and not undercut, democracy. The work is continuing despite the death of Annan in August 2018. Although the topic is a bit outside of Stedman’s area of expertise, he was grateful to have one more chance to work with Annan. “Kofi was many things – smart, a great diplomat, of course – but above all he was an incredibly kind human being,” said Stedman. Stedman is currently a senior fellow at the Freeman Spogli Institute for International Studies (FSI), an affiliated faculty member at the Center for International Security and Cooperation (CISAC), and professor of political science, by courtesy. He also directs the Fisher Family Honors Program at CDDRL. He earned his doctorate in political science at Stanford in 1988 before embarking on his career in academia, first at Washington University in St. Louis, then Johns Hopkins and finally back at Stanford. After the Cold War ended and policymakers began to take notice of the more than 40 civil wars worldwide, Stedman had already been studying them for five years. He was quick to grasp that as difficult as peace settlements were to attain, they were even more difficult to implement. “The worst human catastrophes of the 1990s – Angola in 1993 and Rwanda in 1994 – occurred after peace had been negotiated in those countries,” he noted. Stedman’s best-known article, “Spoiler Processes in Peace Agreements,” was the result of his firsthand experience seeing peace gone bad. His observations resonated with U.N. and NATO peacekeepers who had to contend with warring parties that failed to comply with their commitments. Both U.N. and NATO peacekeeping doctrine changed as a result. Since his time at the United Nations, Stedman continues to do research on civil wars, but has also written on American foreign policy and the need for international cooperation to fight transnational threats. In the last few years, he has broadened his focus to look at the meaning of security and how it has changed over time. That work has brought him into partnership with Stanford Literary Lab. “We invoke security much more frequently than we think about its meaning. Our early conclusion is similar to Inigo Montoya’s line in The Princess Bride, ‘You keep using that word. I do not think it means what you think it means,’” observed Stedman. What particularly bothers him is when American national security is used interchangeably with international security.